Pamela Sztybel’s latest still lifes of flowers represent the culmination of a creative life that has flourished in the garden and in art. Although she grew up in New York, Sztybel has family roots in Finland, and made frequent visits to her grandmother’s house and garden there. 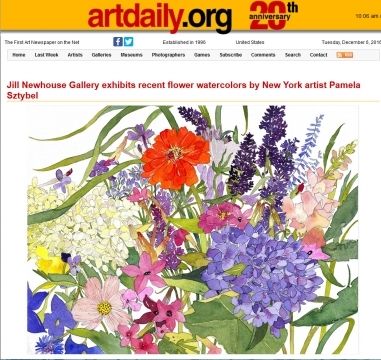 These childhood memories inspired her work and her own Connecticut garden, and became sources for the recent paintings seen in this exhibition. 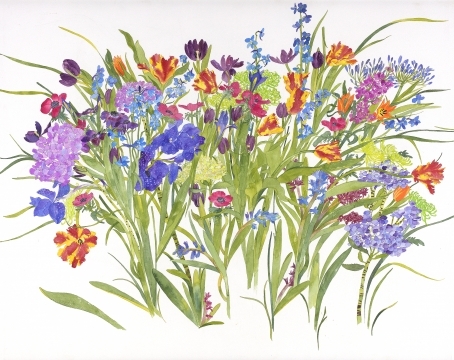 Sztybel begins to work by cutting flowers from her own spring and summer gardens (in winter she goes to the flower district in New York), which she then arranges in vases in her studio. Instinct guides her selection as she applies her preferences to the infinite visual and sensory promptings of nature. She works first in pencil, then adds color almost immediately, so that the composition can evolve organically with color and line interacting. Sztybel frequently turns the flowers as she draws and paints, rather than fix her compositional subject; in fact, some compositions are structured around a single flower viewed from various angles, a strategy that gives her ink drawings in particular a quiet and stately grace. Sztybel chooses a close point of view, and the flowers fill the picture field with expanding rhythms and shapes. The work envelopes the viewer into a domain of great visual and tactile pleasure. “You can grab them in your hand,” she says; and you certainly want to. Pictorial affinities to Styzbel’s work are wide-ranging. She mentions the brightly colored, floating, flattened forms and cropped edges of Japanese woodcuts as influences, while Scandinavian and Finnish masters of watercolor must have been the source for the firm lines, translucent color, and rectilinear rhythms. David Hockney is one of her favorites, and it is rewarding to compare the two artists’ treatment of stunningly beautiful flowers as subjects of unexpected authority. The simple strong lines of the drawings also recall also the work of Matisse and of Ellsworth Kelly. Though painted from life and accurately observed, these watercolors are not intended to be detailed botanical works or even morphologically precise. 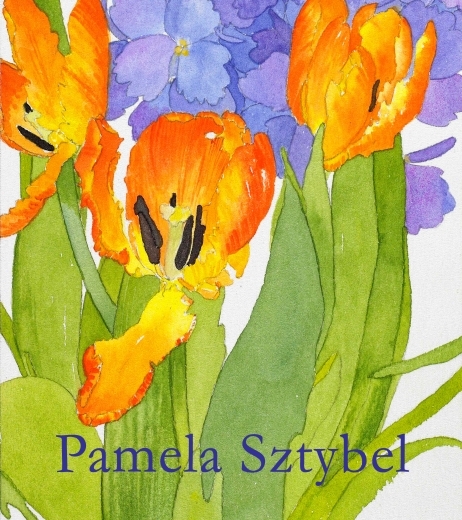 Sztybel wants her color to be true to the flowers she has selected, but once on the page, she manipulates the color to “lie flatly, like a collage.” Flat, but never still, as the planes of color fill the contours of her tulips, irises, and peonies, and the forms spread out like a beautiful map of expanses of splendor.